Here it is folks: The Oh Canada! Pattern. Designed in perfect proportions to the original flag, Oh, Canada! pays patchwork homage to this symbol of Canadian spirit and drive. Make one block or make a dozen. 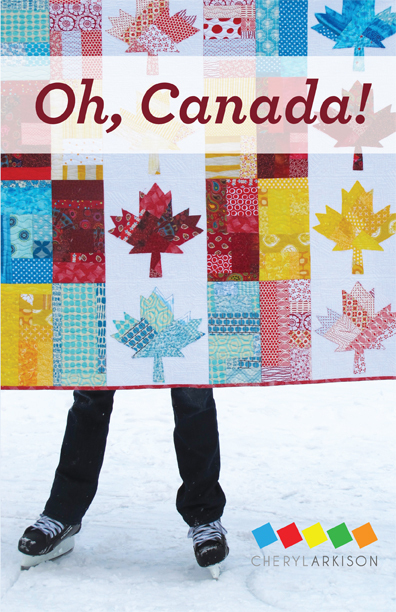 Piece the fabric together from scraps to echo the diverse nature of Canada, or make it solid to showcase the fabric. Available as a download (Thank-you Etsy for making this an automatic feature now) and a printed option. Also available for wholesale orders if you are a quilt or sewing shop. Email me for those details. I'm so excited to share this incredible quilt with you. I'm looking forward to seeing your own versions because no two scrap quilts are the same! Thank-you so much to Jessica at Blue Jay Graphic Design for her work in making this come together. PS Just a reminder that I am teaching this block as a class on Thursday, June 20 at Traditional Pastimes here in Calgary. I love this homage to our great country. ARe the leaves appliqued onto the background??? I love it, I have purchased my copy and will try to find some time to work on it shortly. This is awesome. Well I might just have to visit the etsy shop and pick one up. Looks like a fun time. Love the pattern jacket. Really neat! I'm an ex-pat living in New Zealand and it would be so cool to have this to snuggle when I get homesick (does it come with the snow too?). Love it! Love the colors! Bought the pattern. Made a block. It's nice. Can't wait to start mine!! hope you are safe & dry Cheryl! I was just wondering how you were faring with the deluge in your area. Facetimed my son's girlfriend last night and she's waiting it out in Okotoks hoping to get home to Fernie once waters recede and buses are running again. Hopefully you and yours are staying as dry as possible. I guess there's lots of sewing time?? If the the rest of the fam isn't suffering from acute cabin fever . All the best, oh yeah love the pattern. I saw this hanging at Traditional Pastimes! It's absolutely stunning in person. Thanks for sharing!